Varieties with great beauty and unparalleled quality make Ecuadorian roses one of the most sought-after products in the world, primarily during the Valentine’s Day holiday. Because of this, the Mariscal Sucre International Airport launched the 2018 peak cargo season with an expanded platform that permits the simultaneous parking of six large capacity aircraft (three code F aircraft (Boeing 747-800) and three code E aircraft (Boeing 747-400, Boeing 777-200 and MD-11)), which would facilitate the transport of approximately 15,000 tons of cargo— 15.4% more than last year, according to data provided by Corporación Quiport, concessionaire of the city’s airport. According to Andrew O’Brian, president and director general of this entity, the Mariscal Sucre International Airport exceeded the sum of 13,000 tons transported during the peak cargo season last year. In 2018, a cargo of above 15,000 tons is projected, in 22 days. Expansion of the cargo platform was a measure taken by Corporación Quiport in order to satisfy the demands of one of the country’s principal industries, whose peak production period is for the Valentine’s Day season. “We work towards contributing to the improvement of international trade conditions in Quito and Ecuador; our actions are focused on providing facilities to users, companies and airlines, to continue to make the Quito Airport a gateway for the country’s development,” stated O’Brian, who also highlighted the collaborative and swift work of the General Civil Aviation Directorate to make the platform operational in a timely manner. Quiport invested 3.5 million dollars in the expansion of the cargo platform. The aircraft that can simultaneously load this national product as of January 20 in this ample space and in accordance with international standards, all have large sizes and capacity as common features. A code F aircraft carries 120 tons, while a code E aircraft transports between 90 and 110 tons. 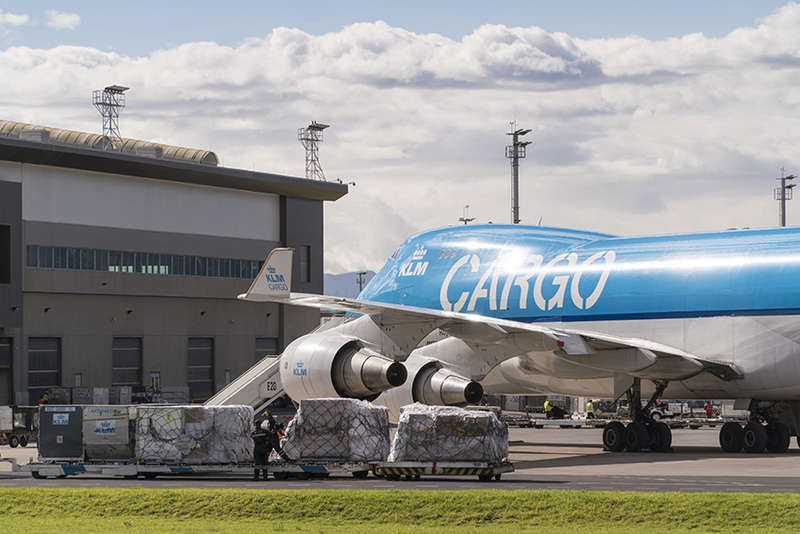 During the 22 days that the peak cargo season lasts, aircraft originating from the United States, the Netherlands, Spain, Luxembourg, Qatar, the United Arab Emirates and Russia will arrive in Quito in order to transport the majestic Ecuadorian flower. In general, the area dedicated to cargo passed from having 15,198 square feet, at the old airport, to 45,000 square feet at the current terminal. This translates into an increase of transport capacity that went from 150 thousand metric tons to 250 thousand per year. In this way, the capital’s airfield prepares itself to contribute to a market that is growing increasingly. According to Instituto de Promoción de Exportaciones e Inversiones (ProEcuador), the export of fresh cut roses increased by 5.4% between January and October, growing from US$ 517 million in 2016 to US$ 545 million in 2017.